Ce est l'unité «signature» à la communauté lotissement VALLEY VIEW convoité de Squaw Valley. 'Convoitée' parce que ce sont les seules maisons de ville deux étages à l'extrémité ouest de la vallée (pas un au-dessus ou en dessous de vous). Plus spacieuses que les chambres d'hôtel exiguë. Vous pourrez profiter d'une cuisine entièrement personnalisée. Garez votre voiture 10 étapes de votre porte. Déneigement est fourni à votre porte. # 1 Valley View a été entièrement rénové tout au long de et joliment aménagée. Le condo est 1100 pieds carrés et parfait pour deux couples ou une petite famille. L'emplacement de la route principale fournit étonnantes, une vue panoramique imprenable sur le domaine skiable ensemble, le village et la prairie de golf à travers deux grandes baies vitrées. Les portes coulissantes en verre à une petite terrasse offrent des vues similaires. Quand vous vous réveillez dans les vues du matin de la station de ski sont disponibles dans le confort de votre lit. Profitez de feux d'artifice de vacances de la salle de séjour. À travers la rue de traîneaux tirés par des chevaux et des traîneaux à chiens sillonnent la prairie. Beau matin et coucher du soleil vues. Vous voyez le scintillement des lumières du village ... un simple de six à huit minutes de marche de la vie nocturne et de nombreux restaurants. En plus de classe mondiale de ski alpin et de planche à neige à Squaw Valley USA, vous pouvez également profiter du ski de fond, promenades en traîneau, traîneau à chiens et le patinage sur glace ici dans la vallée. Vous êtes un court trajet de Tahoe City et Truckee pour les restaurants et la vie nocturne supplémentaires. Plus de photos sont disponibles sur demande. From the moment we arrived it was just perfect. It was clean, small yet spacious and walking distance to The Village. This condo lacked nothing, everything was perfectly placed. The owners were very accommodating and easy to communicate with. Cant wait for my next stay! Thank you for the nice comments about our property. We’re very happy you enjoyed your stay and would welcome you back anytime. Location was perfect and we were able to walk to slopes each day in our ski boots. condition of Townhouse was very great and we had a washer and dryer which was helpful. We’re so happy you enjoyed your stay at our property and found it comfortable and convenient. We hope to have you stay with us again! We had a lovely stay, thank you so much for all the information prior to our stay, including links to activities/services in the area. We will likely be renting from you again! Thank you for your great review and for taking nice care of our place. We’d love to have you and your family back anytime! Cozy, clean & convenient! Perfect for a family. We had a fantastic stay! The location is so close to everything. The condo had everything we needed & was very comfortable & clean! Thank you for sharing your place with us. We will be back! Thank you for your wonderful review. We are so happy our place was comfortable and convenient for you and your family. We would welcome you back anytime! I've rented many ski condo over the years, but this is the first one that I've rented that is truly a home. The owners have taken meticulous care of the place and it is well equipped with everything that you many need for a short or long stay. Booking was easy and the owners were very responsive throughout the process. There is plenty of room for 2 cars, but you can walk to the far east lift or village. 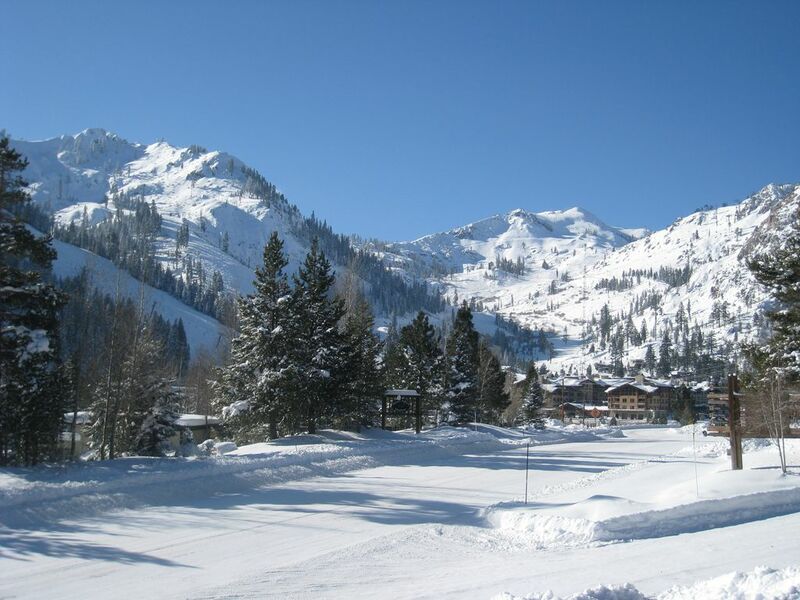 This is a great place for 2 couples or a family looking to enjoy all that the Squaw Valley/Lake Tahoe area has to offer. My wife and I recently stayed at this property. The pictures of the view on VRBO are beautiful, but could never do justice to how amazing the view truly is. The proximity to Squaw Village and lifts is literally a 7 minute walk. Jacki (the owner) is incredibly accommodating, and easy to communicate with with very quick responses. She provided tons of information about the area, and the condo specifically. We traveled up during a snowstorm, got snowed in, and couldn't have had a more delightful time. - Large HD TV + Blu-ray in living room. Nice sound system. HD Cable. - Ironing board, hair dryer, Epsom salt, soap & shampoo... the level of hospitality provided is amazing. - Bedrooms are both downstairs, share a hall bathroom, and are in very close proximity. But totally not a big deal. And I liked not having to haul luggage upstairs. - Condo is right at the mountain, so if you're sensitive to road noise, bring a white noise machine or phone app. Windows and doors are high quality and keep it out well. Overall I highly recommend this place. Mike and I are so glad you enjoyed your stay at our townhouse in Squaw Valley. Thank you for taking the time to write such a wonderful and thorough review. You guys were excellent guests and we would welcome you back anytime! We off a 3% discount off the rental rate if the reservation is paid by check or bank transfer.